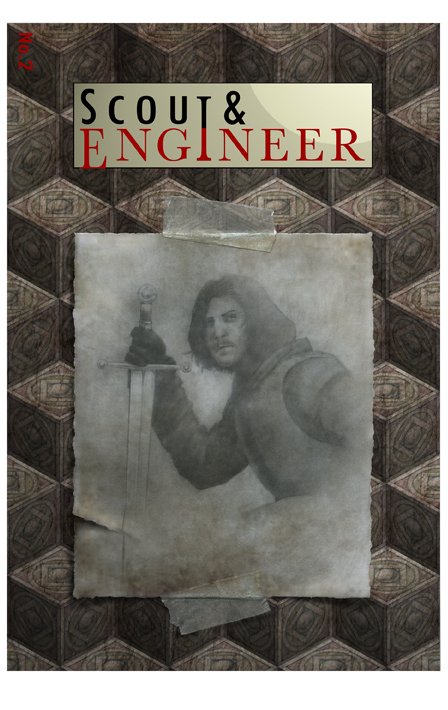 This is the up-coming cover of Scout & Engineer I designed and illustrated, It was a rare chance to not only execute one of my favorite motifs (an old wall surface with attached drawing), but to determine the final placement and look of the logo. It was a wonderful opportunity to try out a complete idea with virtually no stylistic obstacles. In this particular issue, the literary collection is themed around "Heroism" and the publisher/creative director was enthusiastic about this direction, once we chatted over the possibility of taking a non-literal approach. I've been looking forward to utilizing this style of work for quite awhile. Thank you, Hannah, for taking a daring approach. NOTE: You may remember the first one I did; a confident Eve unapologetically displaying the Forbidden Fruit (posted December 23, 2011). Most browsers can't display .tiffs, so maybe convert it to a .png or .jpg or .gif? I like the illustration, though. He looks like a knight, but is he kneeling, or stabbing a body on the ground? And he's looking right at me! Did I just catch him in the act? Mayhap a rogue is afoot. Thanks for the tip and kind word. Wonderful! Makes me wish I had a publication that I could put you to forth 'with! Kind of reminds me of Andrew Ian Dodge. The problem with his quest; he needs a wooden stake--& even then, it only slows down the vampire. I thought wooden stakes through the heart did in vampires. Silver bullets for Warewolves..? Either of which wouldn't stop this president, I fear. You could be right--it's been a long time since I read Stoker. I seem to recall that "staking" the undead was basically a way to "nail" them in place (i.e., confine them; keep them from their misdeeds). It took a little more to "dust" the Count--two big iconic knives. Anyway--such rhetoric regarding government officials could get you in some serious trouble... although if one were to actually commit such a deed for an "approved" reason (i.e., any reason that might be contorted to make Republicans look bad--especially if tied to a "peaceful" religion) it could merit an apology from the Big Kahuna & one of his Secretaries. This page contains a single entry from the blog posted on September 23, 2012 12:02 AM.